​Earlier this week, PennDOT released its annual fatalities report, where we tally the number of deaths on Pennsylvania roadways in the previous year. The good news is that we reached a record low in 2016 with 1,188 fatalities. That's 12 less than 2015, and the lowest since we began keeping records in 1928. But, that's still 1,188 mothers, fathers, husbands, wives, brothers, sisters, daughters, or sons that lost their lives. To us, that's 1,188 too many. 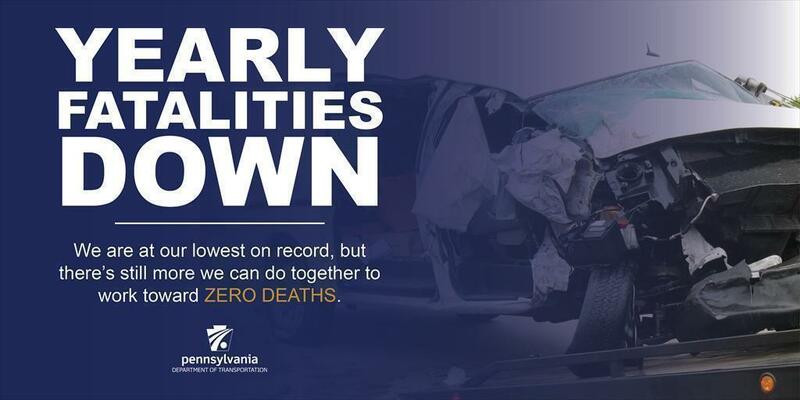 "As fatality numbers continue to trend downward, we still need to change driver behavior, keeping in mind that each person killed in a crash is a member of someone's family," Governor Tom Wolf said in the news release. While the number of highway deaths dropped in many types of crashes, one of the greatest drops was in deaths attributed to drinking-driver-related crashes. Those declined a whopping 14 percent. Other big drops were seen in run-off the road and hit fixed object fatalities. Distracted-driving fatalities also decreased slightly, though other categories involving driver error increased. An estimated 94 percent of crashes are the result of driver error, according to a 2015 study done by the National Highway Traffic Safety Administration. This is why it's important to PennDOT and our safety partners to educate all motorists on the various ways to stay safe on our roads. Whether it's wearing your seat belt and securing your child in the proper restraints, avoiding distractions, or even talking to older drivers about their ability to continue to stay behind the wheel, the impetus to reach zero traffic deaths in Pennsylvania starts with YOU. Slow down. Speeding is a type of aggressive driving often caused by annoyance with traffic or running late. When you speed, there is a greater potential for loss of control, increased degree of crash severity, and reduced effectiveness of occupant protection equipment. Pay attention. Overall crashes related to distracted driving increased by just over 1,200 from 2015 to 2016. Put down the cellphone and give your total focus to the road. This is especially important when in school zones or other pedestrian-heavy areas. Don't drive impaired. Impaired driving isn't just drunk driving — it includes driving under the influence of any behavior-affecting substance. Not only is there the safety cost, but there's the cost of a DUI, which can amount to tens of thousands of dollars. It's just not worth it. Wear your seat belt. A seat belt increases your chances of surviving a crash by up to 60 percent. And many of the excuses cited for not wanting to wear a seat belt have been proven faulty.